GHETT’A LIFE is an “against the odds” action drama set in a politically turbulent inner city community of Kingston. Derrick, a determined inner city teenager realizes his dream of becoming a champion boxer despite a country, community and family conflicted by divisive political system. Derrick dreams of being Jamaica’s next world light weight boxing champion. He knew from an early age that he had the ability to out box even the bigger boys on his lane but it’s election year and politics divide the country and Derrick’s community. His father, a loyal party supporter, forbids Derrick from going to the boxing gym, as to do so he has to cross party lines. Derrick defiantly follows his heart and is confronted with the serious repercussions of his decision. The don of Derrick’s community, Sin, is set on keeping him from crossing over to the “other side” even if it means destroying Derrick’s dream and Derrick’s father is so blinded by political tribalism that he sees Derrick’s actions as betrayal. On the “other side” , at the gym, is a coach who becomes Derrick’s mentor and someone who shows him that Jamaica is bigger than just one community and that Derrick’s dreams are worth fighting for. Derrick’s journey of discovery takes the audience through his coming of age and the realisation that anything that divides cannot be good for anyone. The ignorance of divisiveness gives way to the triumph that comes with unity. 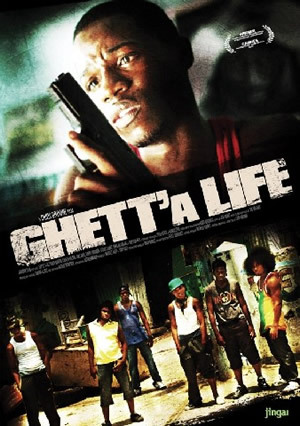 GHETT’A LIFE is a wholly Jamaican film with all investors, cast and crew being committed to an authentic depiction of what life is and what life can be in the inner city of Kingston. This film with it’s positive message of overcoming adversity and ignorance will inspire audiences at home and abroad.